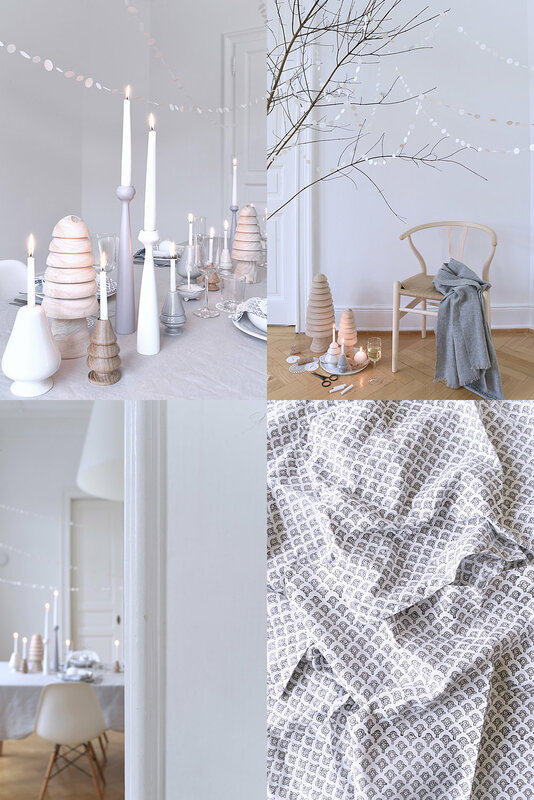 Hello everyone, this is Anke and I thought I'd drop by while Holly's at the imm Cologne in her decor8 booth to first of all, I wish you a happy new year and next, bring you some ideas and inspiration for a wintery tabletop. What I did this time was I put every tree-shaped candleholder (plus decoration) I own on our dining table. Admittedly there are numerous in our possession! Imagine my husband rolling his eyes at this point! Of course less will do. (Imagine him nodding!) Moreover, I wanted to catch the beautiful colors one finds outside in the forest here in Germany at this time of the year. Namely shades of grey (sky), brown (wood) and white (snow). I love this natural and fresh color palette at home. Do you? It recently snowed heavily outside when I shot these images the other day. Perfect timing for this column! But you can easily let it snow above your table, too! Either you make a garland of white paper dots by using a circle punch and sewing the dots in a row OR you just buy one at the Dille & Kamille online shop, if you are not a DIY kind of person! These garlands create a non-kitschy but cheerful and fun decoration. But all regular readers will know that I am generally into paper garlands, I cannot help it! In keeping with the chilly season I picked a wreath illustration with bare branches (bought online at Creative Market) for the name tags you see on the plates and attached jute cord loosely. As I am a huge fan of hearty soups and stew in winter I cooked one of our family's favorites – Sweet Chestnut Soup. This one contains chestnuts (surprise! ), celeriac, leek, spring onions, beef broth and cream. The topping is made of chopped and roasted chestnuts with coarse sea salt, fresh grounded pepper and maple syrup for a sweet touch. Just the way I like it! An alternative to traditional soup bowls are pretty preserving jars.